Saturday at Mohai was a weird convergence of images. We were there for a Regional Sketch crawl meeting up with Portland, Tacoma, Pullman Washington, and Vashon sketchers. However there were interesting people in costume arriving at Mohai all during the day. Part of the celebration was Opening Day of sailing season which happens every year at this time. Big historic ships, flags, people dress in naval attire parade through Montlake cut ship canal. So I assume that was where a decked out Virginia 5 was headed. In the mean time at MOHAI, people running in groups dressed in all sorts of strange costumes, pajamas, tutus, Harleigh Davidson motor cycle wear would arrive at Mohai down by the Clock to answer an Ultimate Urban Scavenger Race question about the jeweler who currently has a similar clock as the one at MOHAI. (The answer was Ben Bridges Jewelers). Imagine this group colliding with a Stretch Limo filled with Wedding attendents, groomsmen, bride and groom. Can you see it??! Well it did happen in one day. See my sketches below for an unbelievable day at MOHAI. The Swift sure Historic Ship Docked at Mohai next to the Duwamish Seattle Fire boat. Although I missed out on a good portion of the sketching that day I still enjoyed being with the other WA sketchers and viewing Gabi's exhibit at MOHAI. Thank you for hosting this impromptu gathering. I just saw this. It was great to have you and Kalina up from Portland. I am glad you got to see the exhibit! You are always welcome to join us if you happen to be in town. Wow! What a sight! You're way too lucky to spot and sketch it. 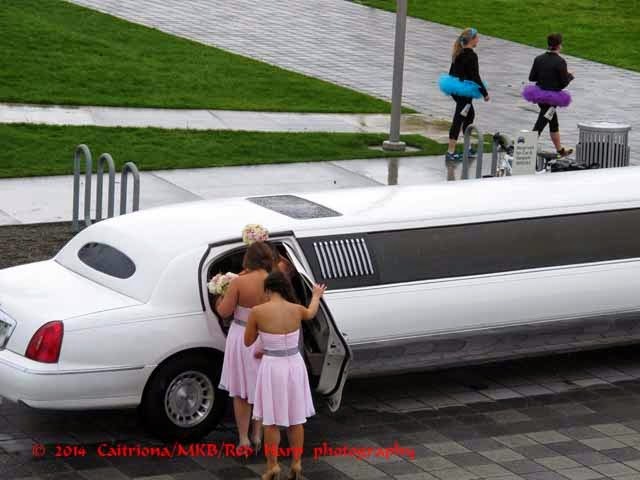 The limousine, in particular, is a quirky touch. Those kinds of things don't just slip into view everytime, and when you see them, you should bet that they're bound for something special. It would really be cool to find out what the story is this time. A great piece of vibrance from a normal day. Kudos!